Alleman High School, shown on this vintage Real Photo postcard from Shannon Hall’s collection, opened its doors in September of 1949. Enrollment that first year was just under 600 students. How fortunate they were to attend school in this beautiful Italian Renaissance style building! The main entrance doors to the school open onto the corner of 11th Avenue and 40th Street. They are framed by three graceful arched openings. Rising above the arches is a wall of tall multi-paned windows that are edged in stone. A decorative iron railing sits at the base of the windows. Other decorative features indicative of the Italian Renaissance style of architecture include carved vases at the roof line of the central corner door and the use of a horizontal banding of stone (a stringcourse) between the first and second floors. The building was designed by architect Edward Lerch of Rock Island. Mr. Lerch designed a number of schools and churches in the Catholic dioceses of Peoria and Davenport. Local works included St. Mary’s School and Convent in Moline, St. Ambrose Roman Catholic Church in Milan, St. Pius X Roman Catholic Church in Rock Island and the Lewis Hall section of the Villa de Chantal. T.S. Willis Company of Janesville, Wisconsin was the builder. They had completed the building of Rock Island City Hall some 8 years earlier. The school was named for Father George Alleman, the first permanent priest in Rock Island County. Father Alleman was born in France in 1806, and immigrated to the United States when he was 26. When he was 28 years old he was ordained a priest in Zanesville, Ohio. By then he could speak English quite well, in addition to his native French as well as fluent German. Later he was to learn the language of several Indian tribes as he served as a roaming missionary throughout the Mississippi valley. In 1841, Bishop Loras of Dubuque, Iowa appointed Father Alleman pastor of Fort Madison where he immediately began the construction of a small church for eight Catholic families. Although headquartered in Fort Madison, he traveled around Burlington, Muscatine, Iowa City, Keokuk, and almost anywhere German speaking Catholics had settled in Iowa, northern Missouri or western Illinois. During his travels he became friends with a fellow religious leader, Joseph Smith of the Mormon settlement at Nauvoo. In 1844, opponents of the Mormons jailed and subsequently killed Joseph Smith. The Mormon settlers left Nauvoo, heading west for Utah. Father Alleman bought the home of one of the Mormon leaders for $900 and converted it into a rectory and church. In 1851, the first Bishop of Chicago urged Father Alleman to move to Rock Island, a community looking for a German-speaking priest. Father Alleman arrived in Rock Island by boat in May and by August he was laying the cornerstone of the first Catholic Church in our city, St. James. Located at 5th Avenue and 22nd Street, St. James was a 30 foot by 50 foot limestone building. Father Alleman was known for his thrift and it was said that stone trim incorporated into the church was salvaged from abandoned Mormon buildings at Nauvoo. When St. James was dismantled in 1863, the stone sills were recycled again into the St. Mary’s rectory. When Alleman High School was built, a small fragment of that original stone from Nauvoo was placed into the cornerstone providing a tangible link between the new school and its namesake. St. James parish grew quickly and was divided into St. Mary’s Church and St. Joseph’s Church. In 1875, St. Mary’s Church established the first Catholic parochial school in Rock Island. Immanuel Lutheran school, which opened on September 1, 1856, with an enrollment of 20, was the first parochial school. St. Mary’s school was soon followed by a second school operated by St. Joseph’s Church by the turn of the twentieth century. After World War I a third parish school was established by Sacred Heart Church. Right at the turn of the century, a new type of Catholic school was established in Rock Island – an all-girls boarding school – the Villa de Chantal. 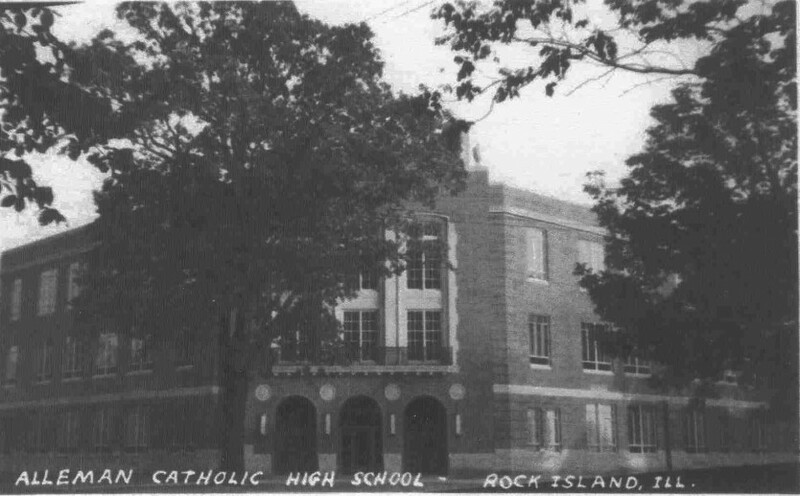 The idea for a Catholic high school in Rock Island County belonged to Rev. John B. Culemans of Sacred Heart Church in Moline in 1926. Monsignor Durkin adopted the project and purchased six acres of land from the W. L. Velie estate for $6,500 in 1931. But the Great Depression and World War II would postpone the building effort. The $1,600,000 high school would not be completed until the fall of 1949. This article, by Linda Anderson, is slightly modified from the original, which appeared in the Rock Island Argus and Moline Dispatch on November 6, 2005.